As the National tree of Wales, the Royal Oak is famous for being the hiding place of King Charles II during the Battle of Worcester in 1651. Symbolising strength and endurance, the mighty Oak is often associated with royalty. It is in commemoration of the tree's significance in British history that we have named our Royal Clogau Oak collection. 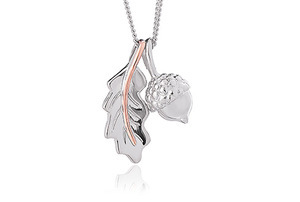 The Royal Clogau Oak silver and rose gold pendant features an elegant oak leaf and an acorn. The Royal Clogau Oak pendant is a unique piece of jewellery that can be treasured forever and worn no matter what the occasion. 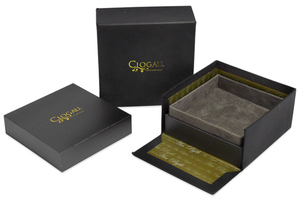 Containing rare Welsh gold, the gold of Royalty for over 100 years.